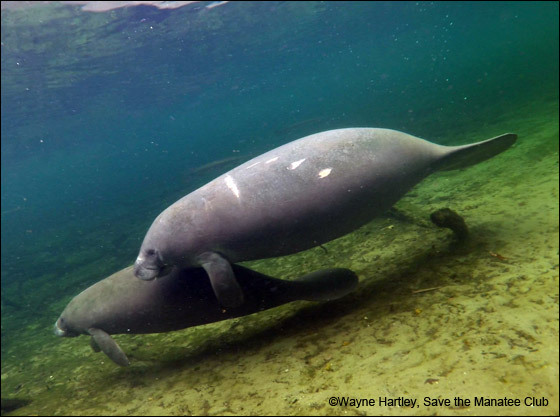 Aqua and her male calf Fabio, spotted by Manatee Specialist Wayne Hartley at Blue Spring State Park in December 2016. Aqua is one of the more recent additions to the Adopt-A-Manatee® program. She is a female and a winter visitor at Blue Spring State Park in Orange City, Florida. Aqua was first given a Blue Spring identification on December 30, 2011. At that time, she was a medium-sized manatee estimated at five years old and had a complex but very faint scar pattern on her right rear flank. Since the pattern was so difficult to see, Aqua was assigned a temporary seasonal number “S104/2011,” indicating that she was the 104th seasonal, or hard to identify, manatee noted in 2011. During the summer of 2013, Aqua received three propeller cuts over her left shoulder. “They were far from the worst I had seen, but they had healed and were white and fairly large,” said Wayne. With obvious scars and several return visits in the books, Aqua was given an official Blue Spring ID: BS719. Her unknown number in the fall of 2012 was U54/12. Aqua returned to Blue Spring with a calf on November 17, 2013. At first, Aqua was labeled as an unknown manatee during this visit because she had acquired a new, large, white scar next to the three already on her left shoulder. Once confirmed as Aqua, her calf was given the name Teal. If a calf doesn’t have or acquire any distinguishing markings by the time it leaves its mother’s side, it will lose its “baby name” since there is no way to identify it once it is out on its own. Aqua arrived at Blue Spring with a new calf on November 27, 2015. Aqua and her male calf, named Fabio, spent the winter of 2015-2016 at Blue Spring. On November 23, 2016, we were pleased when Wayne announced that Aqua and her calf, now a yearling, had been spotted at Blue Spring and were officially recorded as being in for the winter season. They made several visits to Blue Spring during the 2016 – 2017 manatee season. This season, Aqua made her first appearance this season at Blue Spring in late December and has visited several times since then. Aqua is an ambassador for all manatees, and when you adopt her, you are helping all manatees to survive. Each person who adopts Aqua will receive a full-color photo, biography, and adoption certificate, as well as a membership handbook and subscription to The Manatee Zone, a newsletter featuring updates on the adopted manatees when they are sighted, and Paddle Tales, Save the Manatee Club’s bi-monthly eNewsletter. For more information about adopting Aqua, go to Save the Manatee Club’s Adopt-A-Manatee page, or call 1-800-432-JOIN (5646).